Rich flavors from your favorite Thai Restaurant in a quick and easy soup. 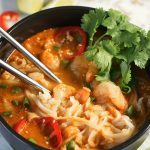 Spicy Thai Noodle Soup with Shrimp takes less than 30 minutes to make and is a hundred times better than takeout! 1 8 oz. package rice or egg noodles, cooked to al dente and rinsed. Divided between four bowls cooked al dente - the noodles will continue to cook after pouring the soup base over the top. Heat a large saucepan over a medium-high heat, add the coconut or vegetable oil. Fry the paste for a couple of minutes, until fragrant. While the soup base is cooking peel and devein shrimp. Slice in half. Add the shrimp to the soup base, simmer for an additional five minutes. While the soup is simmering, cook your noodles (enough for 4 servings). Cooking the noodles according to the package directions. Divide the cooked noodles between four bowls. After 10 minutes, add the fish sauce. Season the soup to taste with a squeeze of lime juice. Divide between the bowls and top each one with fresh cilantro, slices of fresh chili, and spring onions. Serve immediately. *Coconut cream was not available where I shop, I used coconut milk and it was just delicious!